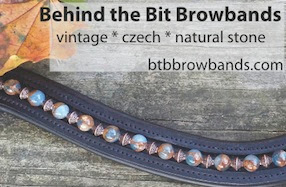 Behind the Bit: Awesome mare, awesome bling! I've watched this mare grow up. She was a wonder at 3, faded a bit at 4 (at least in the footage I saw), and now she is back and better than ever. If Quaterback was a mare, he'd be Rising Sun. And note the noseband bling. She totally pulls it off. Lovely! But do you think she and her rider are slightly at odds? I think the mare has what it takes and her rider is very good too. Just wondering. . .? I love this mare's very natural-looking cadence. I thought the rider was very consistent and tactful. Was that a stretchy trot in sitting trot? I have not seen that before in a test. Hi V Viola, I kind of see what you are saying -- her hands are almost waist high, and there are moments where I think the rider is either struggling to make things happen or just trying to keep her seat through all of that movement. The mare looks happy enough. I can't really judge -- and there is so much to admire!